Tribulation checklist - the Tribulation could begin in 2015! Guess what folks? I think that the Tribulation could begin as early as Sept. 13, 2015. I am sure? Nope. But I am sure that the following events lead up to the Tribulation. And I am certain that these events will happen soon! The thing about the Tribulation period is that Christians may be taken up to heaven before it begins! Please read my commentary titled “Jubilee September 26, 2022 date setting!” in my book “Welcome to the end times”. ISIS gains control of Kobani. ISIS almost took over Kobani, Syria last year but Kurdish troops stopped them. Now the Kurdish troops have left Kobani and ISIS is on the way back there! The Prophet Nahum may make a minor reference to the conquering of Kobani by ISIS. ISIS will be in Mosul, Iraq celebrating the conquest of Kobani when the Mosul dam bursts! ISIS represents a renewed Assyrian State! Read my commentary titled “Will Mosul fall after Kobani?” in my book “The End of ISIS is near!”. June 7, 2015 Turkey holds election. President Erdogan’s AKP party wins most parliamentary seats. The Turkish election is not mentioned in the Bible but Turkish President Erdogan wants complete control over the Turkish government. If his AKP party wins a two thirds majority in the parliament then he will be able to do anything that he wants to. Erdogan is the Antichrist! Read my commentary titled “What is Erdogan up to? ?” in my book “Welcome to the end times”. The Prophet Nahum is all about the destruction of the ancient Assyrian capital city of Nineveh. Today Mosul in northern Iraq is built around the ruins of ancient Nineveh. Things in Mosul look a lot like they did when Nineveh fell in 612 BC. Please read my commentary titled “The End of ISIS is near!” in my book “The End of ISIS is near!”. Turkey invades Syria, wipes out Damascus. In Jeremiah chapter 49 two northwestern Syrian cities hear of an invasion coming from Turkey. Those two cities are Hamah and Aleppo. Jerimiah chapter 49 along with Isaiah chapter 17 foretells the destruction of Damascus. 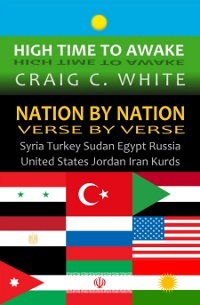 Read my commentary titled “The nations are disquieted over Syria” in my book “Nation by Nation Verse by Verse”. Russia continues conquering nations along its western border beginning with Ukraine. Russia has already created a new Russian economic Union but they won’t stop there. Daniel chapter 7 tells us that Russia will conquer several nations along its western border. Russia will form a new Russian Union. Please read my commentary titled “The Leopard is Upon US!” in my first book “The Fall of Satan and Rise of the Antichrist”. Turkey leads the forces fighting in Syria into Israel. Turkish President Erdogan is the “chief prince” or primary governor of Turkey mentioned in Ezekiel 38 and 39. He will lead two separate invasions into Israel. I think that the first attack will happen after the destruction of Damascus. The second attack is the battle of Armageddon. Please read my commentary titled “Magog Made Easy!” in my book “Turkey invades Israel – Halfway to Armageddon”. Signing of 7 year term Turkey/Israel reconciliation agreement. After Turkey invades Israel they will need to form a peace treaty. Most Bible teachers see this treaty as the event that marks the beginning of the seven years long Tribulation period. I think that the Tribulation period may actually begin with the Turkish led invasion into Israel. Please read my commentary titled “Peace Peace.” in my book “Bible Prophecy 2014-2015”. The Tribulation was designed for Israel’s chastisement. God will lead Israel back to himself through much suffering. During the Tribulation God will also judge the nations of the earth. There will be many wars and natural disasters. Many people will be killed and many will also die of starvation and disease. There will be multiple horrific earthquakes and tidal waves. The Tribulation will be so bad that God has provided a way to escape it through the Rapture. The Rapture is the taking away from earth all of the believers in Jesus Christ. The Rapture begins with the resurrection of the dead! Please read my commentary titled “Tribulation Timeline” in my book “Welcome to the end times”. Turkey, Syria, Iraq, and Iran form the core of a new Islamic Union represented by a leopard. There is a new world empire coming. It will be created when the European Union, the new Russian Union, and a new Middle Eastern Union combine under a ten king council. The Middle Eastern Islamic Union will be represented by a leopard. It will probably be formed after the Destruction of Damascus and after Turkey installs Muslim Brotherhood leadership there. I think that this will happen early on during the seven year Tribulation period. Please read my commentary titled “The Leopard is Upon US!” in my book “The Fall of Satan and Rise of the Antichrist”. Save this checklist and keep it handy. You can check off each event as it happens. If you are a Christian then you will see the day of your salvation drawing near. If you don’t believe in Jesus Christ then you are about to suffer through the most terrible time of trouble that the earth has ever seen. Check out my latest book Welcome to the End Times! Craig, you missed the Election of Erodgan, but it still could still come into play, the false prophert could be this clergy, u are talking about. Time is running out, Closing time is upon us. Erdogan’s AKP party comfortably won the parliamentary election with 41% of the vote. The Republican People’s Party came in second with 25% of the vote. In 2011 the AKP party won 49% of the vote so they lost 8% on June 7th. Erdogan and the AKP party was hoping to win a two thirds majority so they could vote to change the constitution to make Erdogan the dictator of Turkey. Winning a two thirds majority is a very difficult feat. I didn’t think that the AKP party would accomplish that but Erdogan’s party still won the highest percentage of the vote. Erdogan hasn’t lost his position or power. He has just been forced to form a coalition party. Erdogan now has the opportunity to reconcile with his arch rival Fethullah Gülen. Fethullah Gülen may be the False Prophet.